I recently revisited one of my favorite authors: J.R.R. Tolkien. It'd been years since I read either The Lord of the Rings or The Hobbit, but picking all four books this last week reminded of all the reasons I love the stories. On finishing the books, however, I found myself wanting more. 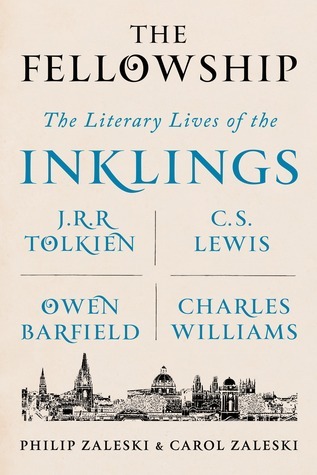 I wasn't ready to jump back into my usual reading patterns and I found myself looking for more on Tolkien and the Inklings. Within a few minutes, the following list was born. Enjoy! The First World War laid waste to a continent and permanently altered the political and religious landscape of the West. For a generation of men and women, it brought the end of innocence—and the end of faith. Yet for J. R. R. Tolkien and C. S. Lewis, the Great War deepened their spiritual quest. Both men served as soldiers on the Western Front, survived the trenches, and used the experience of that conflict to ignite their Christian imagination. 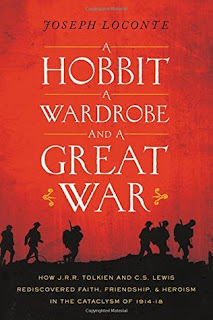 Had there been no Great War, there would have been no Hobbit, no Lord of the Rings, no Narnia, and perhaps no conversion to Christianity by C. S. Lewis. C.S. Lewis is the twentieth century’s most widely read Christian writer and J.R.R. Tolkien its most beloved mythmaker. 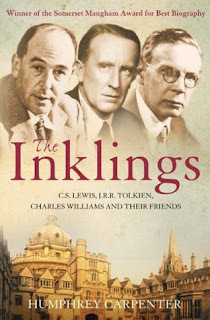 For three decades, they and their closest associates formed a literary club known as the Inklings, which met weekly in Lewis’s Oxford rooms and in nearby pubs. They discussed literature, religion, and ideas; read aloud from works in progress; took philosophical rambles in woods and fields; gave one another companionship and criticism; and, in the process, rewrote the cultural history of modern times. 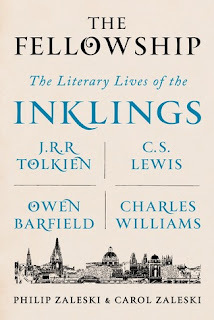 In The Fellowship, Philip and Carol Zaleski offer the first complete rendering of the Inklings’ lives and works. 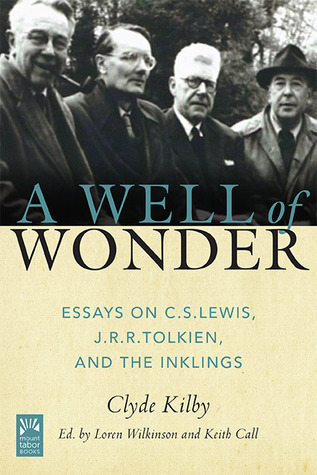 C. S. Lewis accepts Jesus Christ while riding in the sidecar of his brother's motorcycle, maps the medieval and Renaissance mind, becomes a world-famous evangelist and moral satirist, and creates new forms of religiously attuned fiction while wrestling with personal crises. J.R.R. 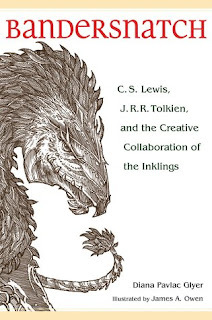 Tolkien transmutes an invented mythology into gripping story in The Lord of the Rings, while conducting groundbreaking Old English scholarship and elucidating, for family and friends, the Catholic teachings at the heart of his vision. Owen Barfield, a philosopher for whom language is the key to all mysteries, becomes Lewis's favorite sparring partner, and, for a time, Saul Bellow's chosen guru. And Charles Williams, poet, author of "supernatural shockers," and strange acolyte of romantic love, turns his everyday life into a mystical pageant. Romantics who scorned rebellion, fantasists who prized reality, wartime writers who believed in hope, Christians with cosmic reach, the Inklings sought to revitalize literature and faith in the twentieth century's darkest years--and did so in dazzling style. C.S. Lewis, J.R.R. Tolkien and their friends were a regular feature of the Oxford scenery in the years during and after the Second World War. They drank beer on Tuesdays at the 'Bird and Baby', and on Thursday nights they met in Lewis' Magdalen College rooms to read aloud from the books they were writing; jokingly they called themselves 'The Inklings'. Clyde S. Kilby is rare among the best expositors of C.S. Lewis, J.R.R. Tolkien and their circle of friends in that he became personally acquainted not only with Lewis and Tolkien, but also Lewis’s brother Major Warren Lewis, Owen Barfield, Lord David Cecil, and others of the Inklings. He particularly captured the soul of C.S. Lewis in his lectures, articles and books, which guided his vision in creating and curating the prestigious Wade Collection at Wheaton College, Illinois. This delightful book makes available Dr. Kilby’s wide-ranging and inspiring take on Lewis, Tolkien and the affinities they shared with their circle, the Inklings, in their enchantment with profound thought vibrant with imaginative wonder which took them beyond “the walls of the world”. C.S. Lewis, J.R.R. Tolkien, and the Inklings met each week to read and discuss each other's work-in-progress, offering both encouragement and blistering critique. How did these conversations shape the books they were writing? How does creative collaboration enhance individual talent? And what can we learn from their example? Featuring original illustrations by James A. Owen, Bandersnatch offers an inside look at the Inklings of Oxford, and a seat at their table at the Eagle and Child pub. It shows how encouragement and criticism made all the difference in The Lord of the Rings, The Chronicles of Narnia, and dozens of other books written by the members of their circle. You'll learn what made these writers tick, and more: inspired by their example, you'll discover how collaboration can help your own creative process and lead to genius breakthroughs in whatever work you do.